Used amp, some cat fur/fluff on the carpet covering. Full disclosure: has had some work done (cold solder joint on board fixed, and driver for HF horn replaced). The suitcase style thing for wheeling it along broke so I took it off. Having said all that, It works, and it's 250W so it's got enough grunt to use live. It's actually quite light for a 1 x 15 combo (around 24kg I think). I think these used to be around £700 when new, but unfortunately for me they don't fetch a lot second hand. £140 reduced to £120. Given the size and weight that would be collected from West London. Exceptional price. I used these back in the early 00’s, always got compliments and also some session time by a top producer who inisisted the amp come too! Dropped off the first page bump. Where about in West london? Cheers. I’ll mull it over, could be good to have at my mates place. Bump. Price reduced to £120. @Chiliwailer I could drop it at your mate's place if it's nearby. Someone take this off my hands. It's taking up too much space. Open to offers. 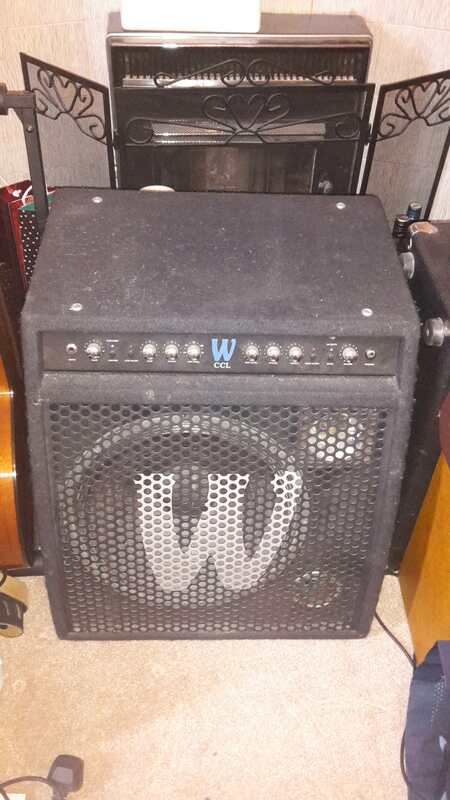 Your chance to get a very cheap giggable bass amp.